A grieving Superman cradles Lois Lane's lifeless body in his arms as he kneels in the wreckage of Metropolis. At Gotham Prison, Batman demands answers from the Joker while Flash and Green Lantern make themselves useful evacuating those citizens of Metropolis who were affected by the missile blast. Wonder Woman tries to comfort Superman, assuring him that it's the Joker who's responsible for Lois's death. But Superman cannot be consoled. He asks Wonder Woman to hold Lois's body and flies off, soon to be intercepted by Green Lantern, who counsels him not to go see the Joker but who, unfortunately, cannot stop the Man of Steel. "Don't do something you'll regret for the rest of your life," Hal Jordan says. But it's too late for that. Back at Gotham Prison, Batman's interrogation continues. The Joker is speculating on what effect losing "it all" will have on Superman just as Superman himself smashes through the wall of the interrogation room, pulls the Joker close and... puts his hand right through the center of the Joker's body. Story - 3: If there's one thing you can count on in superhero fandom, it's that changes to the status quo will lead inexorably to impassioned debate among the fans about whether a given change is, in the simplest of terms, good or bad. It doesn't matter whether the change occurs in the standard continuity or outside of it, putting Superman into certain kinds of situations is bound to elicit a strong response. I think that's great. As far as fandom goes, I'm not so much into things like the conventions and the cosplaying but I dig the colloquies (well, oftentimes). 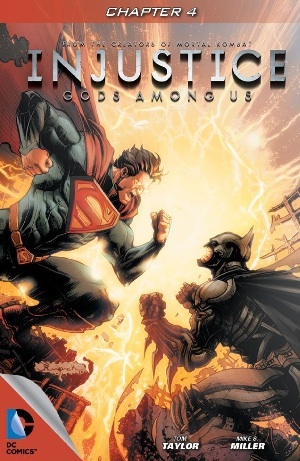 Injustice: Gods Among Us is merely the latest attempt to challenge the status quo - namely, that Superman is incorruptible (and is possibly unique in that way). Plenty of Elseworlds stories introduced alternate origins and histories - at least one in which, as he's being set up to do in Injustice the game, he fills the bill as a dictator - but in the end our boy usually emerges more or less as we know him, one way or the other. In this case, we see him fully formed and he falls from there, which is where the trouble starts because it's now the fall that defines him, and that fall is unlikely indeed. This is the central problem: Superman is so beholden to his emotions - his love for Lois and their unborn child and the corresponding loss of nearly all restraint upon their death - that he is at first much slower than a man with super speed and super hearing should be to find Jimmy, then so unable to control his fear that he is unable to locate the Joker and his hijacked submarine, thus unable to find Lois. If I believed the panic, I would accept the failure to locate the Joker et al. But I don't believe the panic because it has no precedent, while the inability to "see Lois" has no evident physical cause. Everything else follows from this, and it's too bad because, personally, I'm open to the premise, and in fact I am quite appreciative of the aggressive pace of the forward motion. But we've started out on structurally shaky ground, and it's hard to imagine things from here getting better before they get worse. But why I'm ok with the general premise and direction is this: it's because no matter whether they feature superheroes, regular people or talking cats or cans of beans, the best stories always reach us where we're most human and vulnerable. And that, I'd say, is what this is an attempt to do, even if I sympathize with those fans crying foul. The thing is, from where I sit, Superman is incorruptible and this story changes nothing. As both a symbol and a character, he is stronger than any subversion will ever be, whether in an elaborate advertisement for a video game (really the saddest part of all of this) or even in standard continuity. Because, no matter what happens in a Superman story, that story will always be about the limits of invulnerability and the nature of truth and justice. If, in the telling, "Superman" is in the negative rather than the positive space (so to speak) where we're used to seeing him, so be it. At least, as far as I'm concerned. The only thing left is how well it's put together. Thus 3 out of 5 for the flimsy convenience of not only Superman's total enslavement to both his worst and his best fears but also his unexplained inability (apart from the panic implication) to find Lois without having to call in the League. I'm good with most everything else. Art - 5: This is really strong work, each scene conveying both contrasting and contextually relevant moods, with the panels showing Superman crying over Lois's body especially poignant. Miller also has a particular flair for the Joker, which I like because the Joker is probably my all-time favorite comic book villain (call me conventional). Cover Art - 5: If we needed it, here's more evidence of the Superman vs. Batman dynamic that is sure to be at the heart of not only the video game but also the comic book narrative going forward. I don't have the same kind of problem with this as some fans whose comments I've read. Meanwhile, the composition and execution are excellent. Just overall good work.